Thinking of installing a new heating unit this winter season? Or are you getting ready ahead for summer comfort by replacing your old A/C with a new one? You would probably start with the question “How much does it cost to install a new HVAC unit? 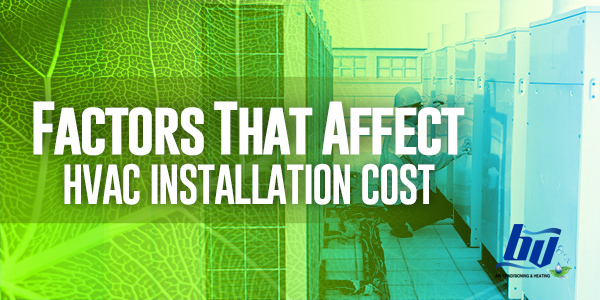 Here’s a list of factors that can affect the HVAC installation cost. HVAC systems come in different sizes, which can affect the installation cost. It’s important to know that the tonnage of the unit does not depend on the weight. For A/Cs, it depends on its ability to cool your building. One unit is the AC’s ability to cool 12,000 British thermal Unit or BTU per hour. BTU refers to the amount of energy needed to heat or cool a single pound of water by one degree per hour. To cut it short, the larger your house, the more tons you need. Obviously, brand of the HVAC system you choose will affect the installation cost. Many homeowners think that the brand is the most essential part, but choosing the right person to install your unit is actually more important. Talk to a contractor you trust and ask for different options and recommendations. Seasonal Energy Efficiency Ratio or SEER refers to how efficient your unit is. To make it simple, the higher the SEER rating, the lower the operational cost. BV Air Conditioning & Heating recommends customers to get a unit with no more 16 SEER rating when having a new HVAC installation. Another factor that can affect the cost of new HVAC installation is the project difficulty. For instance, the cost may be a bit higher if you have hard to access attics, or if your home has blown-in insulation. These challenges during the installation may incur more budget for labor and parts. Your ductwork also affects the HVAC installation cost. Intricate ductworks are extremely difficult and could take couple of days to complete. Ideally, a standard ductwork needs a custom fabricated dampers at both T-Y junction in order to balance airflow. It’s best to bring in a local HVAC specialist for service for your ductwork. Call the experts at BV Air Conditioning & Heating if you need a new HVAC installation.